So it was a big Cup and Shield weekend for the Junior section with 7 out of our 9 teams involved in the days competitive games. We had 4 teams playing cup games and 3 teams with Shield fixtures, to add to that our U16’s and U18’s already are through to the semi-finals of their cup competitions. Our youngest team were involved in a cracker of a cup tie with Worksop Town which was a credit to both teams. 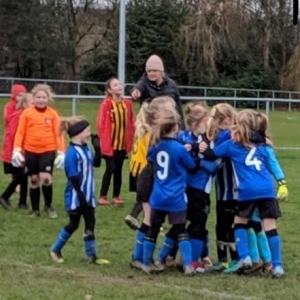 The game was all tied 4-4 at full time and then ended 5-5 after extra time before our squad of little superstars kept their nerve to take the tie 4-3 on penalties. They now go into the hat for the semi-final draw on 31st January where the other teams still in are Huddersfield Town, Handsworth & Doncaster Belles. Scorers: Leah Green (4) & Aimee Herbert. The U10’s also progressed to the quarter finals of their age group competition with a comfortable 10-0 victory over Barnsley Blue. They now face a strong Barnsley team in what should be a cracker of a game in the quarter-final game due to be played 21st January. Scorers: Eliza Benson (4) Elisha Whitaker (4) Miley Colton & Sofia Manfredi. Our U12’s played some great football and led twice in their cup game. They faced a good Belles team, who currently sit 2nd in the first division. Half time score was 2-2 with Doncaster scoring a further 4 goals in the second half to take the deserved (if not slightly flattering) victory and progress to the semi-final. A comfortable passage through to the semi-finals for our 100% U14’s, they progressed after a 11-0 victory and take their place in the draw alongside Doncaster Belles, Dronfield Town & Handsworth. Scorers: Maddie Wilson (3) Alisha Attwood (2) Brooke Betts (2) Evie Wood (2) Ella Butcher & Lily Beevers. Our U13’s bowed out of the competition at the quarter final stage after a tough 2-1 defeat away at Barnsley. They led 1-0 at the break with a goal by Millie Stephenson before Barnsley struck twice in the second half to progress to the semi-final. A great team performance from our U11’s who progress through to the semi-final where they will be in the draw with Rotherham Utd, Harworth Colliery & Crosspool Juniors. Our girls had a comfortable 10-0 victory over the Steelers with goals coming from Kelsey Spink-Robinson (3) Sophie Goodwin (2) Holly Lee (2) Ava Forest, Madison Lee & Amani Saleh. Our U15’s also progressed comfortably to the semi-finals after their 11-1 victory away at Thorncliffe. They will now be in the draw alongside Dronfield town, SUFC Comm Red & SUFC Comm White. Scorers: Abby Hodkin (4) Neve Renwick (2) Evie flint, Lucy Robinson & Megan Cumberbatch. Our U18’s and U16’s are already in the hat for the semi-finals of their respective cups with the 16’s in the hat with Millmoor, Sheffield FC & Doncaster Belles. Our U18’s are in the draw with Huddersfield, Sheffield FC & SUFC Comm. The team also maintained their 100% record after another win in the league, this time they finished 6-0 winners away at Sheffield Utd.